Homes for sale in Charlottesville range from small bungalows to large historic mansions. Charlottesville is located in central Virginia approximately 60 miles west of Richmond, Virginia and 90 miles west of Washington DC. Charlottesville was established as a town in 1762 by the Virginia General Assembly, and was incorporated as an independent city in 1888. As a result of eight annexations, the most recent of which was in 1968, the City is 10.4 square miles. The City is autonomous and entirely independent of any county or any other political subdivision. It does not have the same boundaries with or is not subject to taxation by any county or school district, and is not liable for any county or school district indebtedness. It is home to the University of Virginia and Thomas Jefferson’s Monticello. UVA is known for it’s large medical hospital where patients come from around the state. The City limits Charlottesville is relatively small with a population of about 45,000 people. Charlottesville is surrounded by Albemarle County, home to many vineyards. 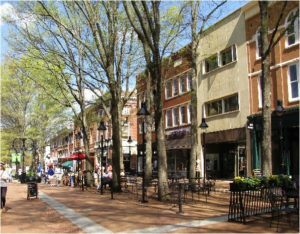 One of Charlottesville’s best attractions is its Historic Downtown Mall. The Downtown Mall is filled with boutiques, restaurants, ice creams shops, live music and the Intelo’s Pavilion. Views of the Blue Ridge Mountains frame our landscape and can be seen throughout the Charlottesville area. If you are looking for a home for sale in Charlottesville, Virginia our team would be happy to assist you.